Hey guys ! I have been doing group sound baths at yoga studios for about a year now. My main instrument is the gong but I have also acquired a set of crystal singing bowls for the 7 chakras. When I do my sessions I enjoy playing and people often go very deep into meditation, sleeping. Some find it very relaxing, some have vivid visions. Yet others experience clearing symptoms such as crying and fatigue or other wise unpleasant symptoms. I know this is a sign that they are releasing energies that were previously stuck and the emotional release is a good thing. But some people may get turned off and not want to come back because of the emotions coming up. Can this be helped? Or are some people just not ready to release ? I am a clinical social worker with 20+ years of experience and an interest in trauma work. I also have been playing Gongs and Singing Bowls for about 7 years. Here are some of my thoughts: when we play gongs and singing bowls I believe we are (can be) activating in individuals emotional arousal in non-verbal states of being. Everyone who shows up to our Sound sessions brings their own person history and experiences with them to the session. Just as we all dream - we all do not not have the same dream every night. Some will have incredibly beautiful experiences (see colors - astral traveling - spiritual guides) others may have powerful "negative" experiences - crying - frightened - exhaustion and yet still others may feel unable to articulate what they experienced. In a group setting feeling safe to discuss - process these feelings and experiences may be challenging, particularly after another person states what a great experience they have had. Large groups can make this even more challenging. We try to orient participates to how to take care of themselves during a Sound Session in a group setting (its ok to open your or quietly eyes sit up) We also realize some folks more experienced with sound like and actively request some degree of loudness to "break through" emotional blockages, while this is perhaps challenging for someone new to the experience. We do try to hang out at the end of a session if someone wants to discuss further there experience. Perhaps offering an "introduction to sound" where the sounds could be initially gentler or less sustained might be an option. Yes emotional release is a good thing but I feel this practice is a powerful tool for many things related to the physical emotional and spiritual being. I will say that two things the Gongs in particular have taught me 1. SLOW down....do not feel you have to continually hammer at them (yikes!) 2. Let the sounds complete.....don not feel you have to continually hammer at them. For me part of the lesson of playing with sound is to be able to listen to sound until all I hear is SILENCE. Hi Shari, good question and topic to explore. In my Sound Medicine work (as I suspect with many others here) it is not at all uncommon for people to access and release strong emotional material which may bring with it varying degrees of tears. However, in nearly all cases these emotional responses were not considered "unpleasant", as a healing emotional release by it's very nature usually leaves the person feeling lighter and more whole and at peace afterward. So in my experience these responses have nearly always been cathartic and met with gratitude. Also, there's the simple fact that we can't please everyone, so some simply won't return because they just didn't like it. Have people specifically told you that the emotional content that arose was unpleasant for them and that they were not going to come again because of that? Some people just don't like a whole lot of gongs and some don't like crystal bowls. (I myself don't like a whole lot of gongs nor the way many people play crystal bowls!) I've been practicing and working with sound for decades and don't use any crystal bowls in my practice and I only have one gong. I do have a dozen or so metal bowls and will bring out 7 or 8 of them for public offerings (plus many other instruments and my voice). Of multiple gong and crystal bowl offerings I've experienced, I'd say the majority of them I would not want to go back to either - and that's me and my experience, others may and do feel differently. I'd suggest talking to the people coming to your events and inviting honest and open feedback (and maybe you already do that - just do it more!). Even then, we need to listen beyond the words people are speaking to us and to attempt to sense what they might really be feeling, what really might be the experience happening in the room. Without getting too obsessed with second guessing ourselves and others I think we can learn to feel and perceive where we are "doing it right" and where we might be able to improve on our offerings, and where we also can let go of our desires for certain outcomes. Yes, I agree, important points! Just this past Saturday I did a Sound Medicine event and one person (someone who has come to several of my offerings) said afterward that for quite awhile she was experiencing some very unpleasant nerve impulses in her left hand. Then at some point we moved into a passage of group chanting and as soon as she joined chanting the unpleasant impulses stopped. Then the chanting phase ended and as I continued with the next phase of sound or music in the journey she said all was fine and that she "flew".... and wanted the whole thing to go longer than it did because she had finally 'taken off' on the sound. What happened with her? I can't say other than obviously energy was moving (or being blocked from smoothly moving) in some manner. Could I have prevented it from happening? No. Could I and did I address her experience in a thougtful and responsible manner afterward? Yes. Awesome great comments so far ! We do after-care but some people may not want to go into a personal details in a group setting. I have been to gong sessions before by my Medical Doctor and I didnt really enjoy it (the gongs do ROAR) but when he invited me to play i loved playing and still do. I haven't tested the crystal bowls out yet in a group setting. I would say sound / percussion tends to be "disruptive" and its not like music therapy where someone plays a piano and you just chill out and say "thats lovely"
I had a similar experience you had where the first session I played someone had sharp pain in their elbow and in their arm while I played. They kept coming back to the sessions and never experienced the pain again. The physical, emotional and psychological reactions are many and varied. Some people have visions and lucid dreams. Others relax, love it and keep coming back. Yet others feel nothing, its just "white noise" to them. No, no one has told me to my face they are not coming back nor has anyone described their reactions as "unpleasant". I am just projecting onto them because I guess I associate crying as "bad". Personally I have never felt to cry but I have felt really tired and needed to rest after sound sessions that were done for me. Or I have generally felt out of sorts for a day or two after a gong session with my doctor. I like the word you used "cathartic"
I appreciate the thoughts so far and welcome more comments on this topic. To be honest this may be more about my personal discomfort with their emotional expression but I am by nature a gentle creature so I take it personally when people feel anything other than bliss after I play which as you said is unreasonable because of the richness of the human experience and I think I have to be better prepared for the variety of potential reactions to the sounds. The first time I went to a gong event, the two practitioners hammered on both gongs without letting the sounds complete. It was horrible. Before they began, I was in a nice meditation. After they started, I heard constant talking, as if I could hear everyone's thoughts. I seriously considered leaving. One other person had a bad experience, but everyone else (30 people) loved it. And no, they didn't tell us beforehand that we might have an unpleasant experience. I thought I didn't like gongs. Luckily, I've had two friends since who play gongs beautifully. I go into theta state every time. Each experience is different. I've cultivated an intention of love in my voice when I sing and I've done a fair amount of singing for New Thought churches. I can be singing the most upbeat song and someone will burst into tears and leave. I've had it happen a few times now. Later, they'll tell me that something in my sound will open up their hearts and they'll finally get through a past hurt they didn't even know was there. Just a reminder that intention is a powerful thing. greetings, I have been playing gongs and singing bowls in group sessions for about 4 years. I also have a private clinic using tuning forks. before that I was a professional musician (percussionist) for 35 years. I have been to some "Gong baths" where the person hammered away on several gongs, leaping between them and I wondered what they were playing at. was it a look at me show. I didn't enjoy them. gentle is as good as hard. silence as good as sound. In Soma energetics we learned that the powerful healing happened at the quieter end of the notes. What we are thinking about and the emotions that pass through us while we play are carried on the waves so it is very important to stay present and aligned with the Divine and good intention. I also make it a point of grounding the individuals before I start the sound healing. talking them into the present with guided meditation and either singing a very low drone or using a low om tuning fork to ground. At the end of the session I again make sure I ground everyone as we don't want them walking out into hectic communal space while they are still "flying" or feeling vulnerable. I also explain that they have had a powerful sound healing and to drink plenty of water over the next three days to help flush through what ever has been processing within them. To watch their thoughts and emotions over the next 3 days as what we have released may surface but that it is being released and not to chew or obsess on it but to acknowledge it and let it go. Some people just come for the experience and that is enough. Not everyone is in touch with their body enough to feel what is happening. Most people who have experienced pain in a session have said it passed through them. Most of the time the problem does not return. old war wounds being processed. cellular memory being flushed out. Meridian lines unblocking. I quite often explain this in my opening statement. Do your best with loving intent and don't take it personally if they were only there for the experience, like going to a concert. Great comments and thoughts, thank you ladies ! Although your short description brings to light some of your 'after session' insights, it would take a rather long explanation to describe the 'nature' of what is actually being processed and experienced. There are many facets to all of this, including what your doing, and what each individual is experiencing. Group sessions are different than personal sessions for one. And in a group situation you may not receive 'feedback' from everyone involved. One thing I do in a group session is to inform them that they can talk to me privately afterwards. Assessing their experience takes not only experience in this area but knowledge in many areas. To name a few, Psychology, Anatomy, Physiology, Neuroscience, Cognitive Psychology, and Music Philosophy. The release of trauma and how to deal with it, is another issue. 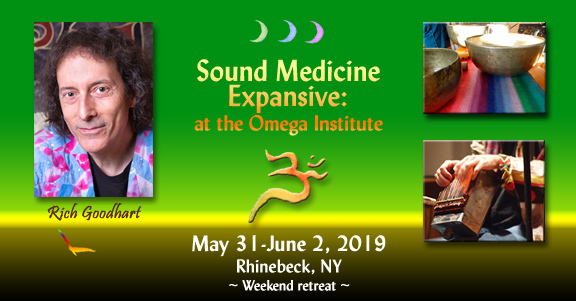 Sound Therapy, Sound Healing, Sound Worker, whatever the title, is someone that is dealing with consciousness, whether their laying down in a yoga studio, or on a treatment table. Stay focused on what you know, assess your ability, don't wander off in areas you have no experience in, and improve your learning curve at every chance you can get. Thanks Mitch I was wondering when you were going to weigh in ! I do open for questions and comments after but most people seems very bent on sharing their mystical experiences. I get several stories from people who feel like they have left their bodies or experience visions either with scenes from their own life or another time. My husband is very grounded and promptly falls asleep. So I am learning about the wide possible reactions to the sound. I noticed a few people mentioned "trauma" and its release in a sound healing session. I think a lot about babies and children who when upset will openly cry and then be over it just as quickly as the torrent of tears came down. I think a lot of adults may bottle and suppress emotions in the name of being "well behaved" and not making anyone else uncomfortable. Because they suppress perhaps feeling the urge to cry may be labeled as unpleasant or bad by them whether or not it is a necessary and important part of their healing? Thanks for your feedback everyone and stories from your personal experience. I am always open to hearing more. After session dialog is important if not for you, for others in the room as well. A comment from one, may mean very much to another. But letting people know that they can talk privately with you is also important. Don't judge completely their experience in relation to what you were doing. Anything can surface at any time, remember this. To me, group sessions are harder because you cannot observe everyone as close as you can in a private session. This is not easy work, and the more you do it, the more you are reminded of this. Great thread. After a general introduction, we typically pick a topic related to awareness, consciousness, limiting thoughts and belief systems, and people being and living "in the box" by habit and habitual patterns. Before beginning with a very specific guided meditation, we then, for about 15 minutes or so, move on to introducing the history of the gongs and elements of sound therapy and how they can assist in the process of raising one's awareness. We then point out the fact that everyone experiences a sound session differently, as we all are at different points on our individual paths and have different histories, agendas etc. Without wanting to put people into a specific frame of mind, we do mention that temperature variations, tingling, and other physical sensations do occur. We also point out that, while everyone experiences it differently, it is very common for people to have releases of a psychological, physiological, spiritual and / or emotional nature. This is just for them to be prepared if it happens. Another point that is helpful to mention is the fact that we, the providers, are different people each time we play the gongs. In addition, the group energy carries it's own dynamic and even the space carries a different vibe each time, not to mention the influential aspects of the sun, moon and the stars etc. So as with all else, it is in a constant state of change. And yes I agree with the previous comment, do not take any of the feedback from the participants personal. It is nearly impossible for you to please everyone in the room, especially in a group session. One other element that we have found to be very beneficial is to review a questionnaire with 21 specific questions that we send out to all new participants. We are collecting data as it relates to our presentations as well as style of play. After session dialog is important if not for you, for others in the room as well. A comment from one, may mean very much to another. But letting people know that they can talk privately with you is also important. I second this very strongly - both the after session dialog being important for others in the room, and letting people know that they can talk privately with me afterward. And yes, a comment from one, may and very often does mean a lot to another. Don't judge completely their experience in relation to what you were doing. Anything can surface at any time, remember this. To me, group sessions are harder because you cannot observe everyone as close as you can in a private session. This is not easy work, and the more you do it, the more you are reminded of this. I agree with this too. Though I do think that it can be "easy" work if we don't care about what happens with our audience! If we choose to show up and be both aware of and responsible for the work we are doing, then yes, the more we do it, the more we are reminded of the complexity, responsibility and challenge of doing this work right and doing it well. A very important element, in group or private work, is being able to show up without an agenda. No thought that we are going to heal anyone, no idea that we are going "do anything" in particular to anyone. That's way too much of a weight to carry, it's a projection of our own ego, and it's a great way to get in the way of something good and real happening, coming through the sound, for participants. My teacher Saruah Benson always made a point of declaring (silently) to the universe, or God or Spirit or however one sees it, "let me be an instrument for the highest good of all involved", just before beginning. I also declare that I let go of all agenda, all thought toward "doing" anything for anyone, and that I am now in this moment showing up free and clear as a servant of Spirit through the Sound.